Man has been marking the body with tattoos and scars for over 5,000 years. The ancient mummies of Siberia, Egypt, & the glaciers of the Tyrolian Alps, all have examples of significant body tattooing. Tattooing and marking the body has been prevalent in every wave of human evolution since we stepped from the stone age up to modern society. There is a powerful renaissance of traditional tribal tattooing taking place throughout indigenous cultures around the planet today. From the islands of the Polynesian South Pacific, to tribal groups of Africa - there is a resurgence of the marking of the body as a sign of traditional initiation and ritual. As tribal cultures begin to re-establish their identity in a post-colonial environment, they are reaching back into their past for ways to re-establish their identity for the future. One such way is, as their ancestors did, to mark the body with a tattoo or scar. In conjunction with this renaissance is an absolute explosion of the art of tattooing in modern western culture. From the street Gangs of East Los Angeles, to shopping malls of middle America, to the Modern Primitive movement started in the Height & Asbury community of San Francisco, to the maori gangs of Auckland, New Zealand - the marking of the body has arrived as a significant movement in a 21st century modern society. ANCIENT MARKS traces the use of marking the body with tattoos & scars throughout the globe, including within our modern Western society. The project is a culmination of seven years of travelling and photographic documentation to six continents, and over thirty countries. The book takes the viewer beyond the cultural stereotypes of tattoos merely as a fad, or done only by criminals, sailors, and motorcycle gangs. 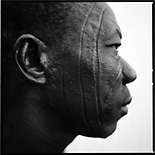 But rather into the marking of the body as a powerful gesture by every culture, every tribal and modern society to establish a unique identity within the community. Whether to signify one has moved from childhood into adulthood, or adulthood into warrior status—humans have a need to belong to a special and often elite group. Whether it be the Japanese Ikuza Mafia, or the Mursi tribes of Ethiopia, or even adults found yearly at The Burning Man Festival in the desert of Nevada—humans need to mark their bodies and belong to a human group. The book ANCIENT MARKS picks up where various other tattoo books have left off, in that they show only modern western pop cultural tattooing. This book examines the roots of why mankind marks the body, as seen in the vast examples of traditional cultures scattered around the planet—and explores examples in haunting and mysterious black and white images that provoke the viewer to ask why do we mark our bodies, and why has mankind done so since the dawn of civilization.